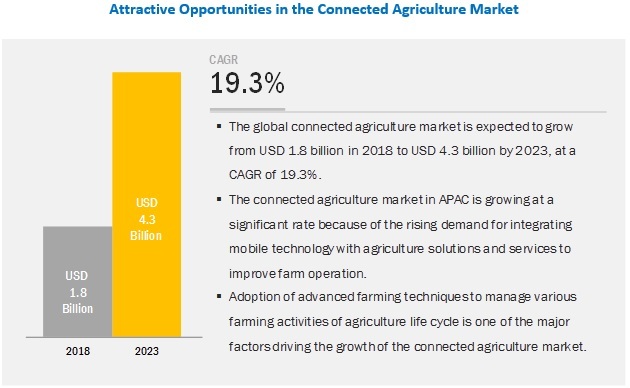 [134 Pages Report] MarketsandMarkets expects the global connected agriculture market size to grow from USD 1.8 billion in 2018 to USD 4.3 billion by 2023, at a Compound Annual Growth Rate (CAGR) of 19.3% during the forecast period. The major growth drivers of the market include government initiatives to deploy modern agriculture techniques, rising pressure to meet the global demand for food, and need to improve farm productivity. The growing need for agribusiness to effectively increase farm yield is contributing to the growth of the connected agriculture solution segment. Crop yield depends on multiple factors, such as weather parameters, soil condition, fertilizer application, and seed variety. It becomes very challenging for farmers to identify the critical factors from large data sets that can impact their farm productivity. Connected agriculture solution allows correlating a wide variety of farming data to get valuable insights for increasing productivity. The in-production planning and management application area includes water and irrigation management, breeding and feed management, crop scouting, production monitoring and maintenance, animal tracking and navigation, and agri-finance and insurance management. The in-production planning and management application include varied tasks performed daily. Any mismanagement in preparing farm for the crops, and diet or tracking of the animals can cause major loss to the farmers. Hence, farmers are investing toward connected agriculture solutions that help them in managing their farming process for quality production. The platform segment in the connected agriculture market comprises device management, application enablement, and connectivity management. Among these, the device management platform segment is expected to hold the largest market size owing to the growing requirement for access and control over connected devices used in the agriculture industry. The increasingly competitive landscape and need to meet the global food requirements enforce farmers or growers to turn to the connected agriculture platform to enhance the usage of resources for better production. 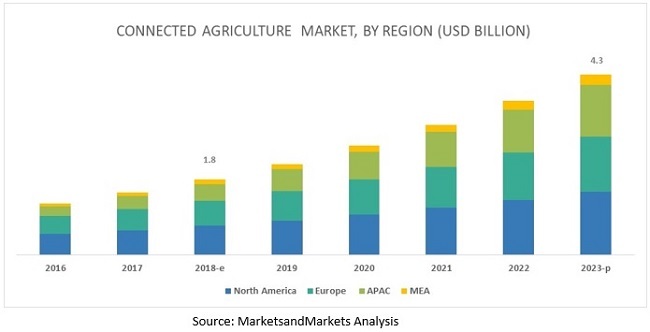 North America is expected to hold the largest market size and dominate the connected agriculture market from 2018 to 2023. The region majorly has farms with the best-in-class farming equipment, which largely contribute to the growth of the market. APAC is expected to provide lucrative opportunities for the connected agriculture vendors, owing to the increasing investments in the connected infrastructure, digital agriculture practices, and implementation of cloud-based solutions among growers in the region. However, lack of standardization for data in various regions could affect the adoption of connected agriculture solution. 15 major vendors offer connected agriculture solutions, platforms, and services across the globe, and they are IBM (US), Microsoft (US), AT&T (US), Deere & Company (US), SAP SE (Germany), Accenture (Ireland), Cisco (US), Oracle (US), Iteris (US), Trimble (US), SMAG (France), Ag Leader Technology (US), Decisive Farming (Canada), Gamaya (Switzerland), and SatSure (UK). IBM, a leader in offering an extensive set of solutions and services under its modern agriculture portfolio, caters to the needs of farms across the globe. The company offers Watson Decision Platform to its global clientele for leveraging the benefits of connected agriculture. The solutions help customers analyze real-time data, improve the yield, and minimize risks. As per its organic growth strategy, the company is aggressively increasing its global data center footprints to support massive big data workloads and cognitive capabilities, along with flexibility in its offerings to suit its clients’ requirements. For instance, in April 2017, IBM opened 4 new cloud data centers in the US to cater to its enterprise clients’ increasing demand for cloud infrastructure and to support the growing demand for data and cognitive capabilities. In December 2018, Iteris collaborated with Hummingbird Technologies, a UK-based drone and satellite-enabled data and imagery analytics business, for precision agriculture. The move aimed at collaborating Iteris’ ClearAg smart content onto Hummingbird Technologies’ aerial crop analysis platform. This collaboration would empower users by enhancing the ability to detect crop diseases at early stages of the crop life cycle and minimize risks while improving productivity. In September 2018, SAP signed an agreement with CrowdFarmX, a Singaporean startup, to deploy its S/4 HANA public cloud. As per this agreement, CrowdFarmX would be able to speed up the onboarding process of farmers on its platform, thereby enabling them to connect directly to the global market. It would also assist farmers in enabling their customers to deliver high-quality and huge-quantity yields. In October 2018, Microsoft partnered with SlantRange, a leading provider of remote sensing and analytics system for agriculture. This partnership enabled SlantRange to offer new aerial measurements and data solutions for the agriculture industry. In June 2018, The Weather Company, an IBM business, partnered with one of the leading Indian agro start-ups, AgroStar. The partnership aims at transforming the traditional agricultural operations in rural parts and enables farmers to make informed decisions to increase productivity. As per the terms of the partnership, AgroStar would leverage the local weather forecast data and insights from The Weather Company and provide critical insights into crop disease risks and the probability of risk and disease occurrences to help farmers reduce the extent of crop damage and increase the yield. What are the major challenges faced while deploying connected agriculture solutions in different application areas? What is the level of preparedness of farmers to deal with unforeseen business risks? What are the challenges faced by connected agriculture vendors while integrating digital farming technologies with a client’s farm equipment? *Details on Business Overview, Products, Solutions, Software, Platforms & Services, Key Insights, Recent Developments, SWOT Analysis, MnM View might not be captured in case of unlisted companies. The study involved 4 major activities in estimating the current market size for the connected agriculture market. Exhaustive secondary research was done to collect information on the market. The next step was to validate these findings, assumptions, and sizing with industry experts across the value chain using primary research. Both top-down and bottom-up approaches were employed to estimate the complete market size. Thereafter, the market breakdown and data triangulation procedures were used to estimate the market size of the segments and subsegments of the connected agriculture market. In the secondary research process, various secondary sources, such as D&B Hoovers, Bloomberg BusinessWeek, and Factiva have been referred to, to identify and collect information for this study. These secondary sources included annual reports, press releases and investor presentations of companies, whitepapers, certified publications and articles by recognized authors, gold standard and silver standard websites, regulatory bodies, trade directories, and databases. After arriving at the overall market size using the market size estimation processes as explained above, the market was split into several segments and subsegments. To complete the overall market engineering process and arrive at the exact statistics of each market segment and subsegment, the data triangulation and market breakdown procedures were employed, wherever applicable. The data was triangulated by studying various factors and trends from both, the demand and supply sides.